Bellingham Marine representatives travel to the U.S. to see what leading marina developers and designers are building. The goal – spread good ideas and foster innovative thinking across Australasia. A group of 30 senior industry leaders from around the globe met in the U.S. to ensure customers worldwide have access to the best and most innovative marina design available. Brisbane, QLD, Australia – 17 May 2018 – Local marina expert, Bellingham Marine, is fueling competitiveness and innovation with a recent tour of prominent U.S. marinas. 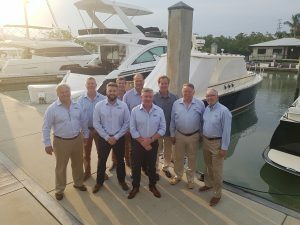 Management from the company’s Australia, China and New Zealand divisions travelled to the U.S. to tour some of the States’ top marina properties. During their time in the U.S., the team also met with a group of 30 senior industry leaders from around the world. The group embarked on an expansive tour of marinas in both California and Florida, two top markets for boating in the United States. Stops included the recently completed 1,624 berth Alamitos Bay Marina in Long Beach, California, the largest municipal marina in the nation. The group also visited notable marinas in Florida, including the renowned Rybovich superyacht facility in West Palm Beach and the exclusive marina at Ocean Reef Club in Key Largo. The visit wasn’t all work for the team, who were able to indulge in some uniquely American experiences. The group did some shopping at an outlet mall and visited a local gun range. The highlight was an Everglades airboat tour. Airboats are flat-bottomed boats propelled by an aircraft-type propeller and are synonymous with the Florida Everglades experience. Bellingham Marine has offices in Brisbane, Melbourne, Sydney, Auckland and Zhongshan City, China. Sales staff stand ready to provide premier marina design services to customers in the region. Contact them today to take advantage of their extensive knowledge and experience in pontoon design. As the world’s leading marina design-build construction company, Bellingham Marine specialises in pontoon, floating platform and floating breakwaters for marinas worldwide. The company also produces dry storage systems for the upland storage of boats.